On a continent where growing enough food to eat is a constant battle for millions of families, there is a new threat: the fall armyworm. In a little less than 2 years, this pest has eaten its way from West Africa to South Africa, and is now damaging crops in virtually every country in sub-Saharan Africa. “This pest is expected to be a major shock to an already fragile economic situation for many millions of households,” says Shaun Ferris, Catholic Relief Services’ director of agriculture and livelihoods. 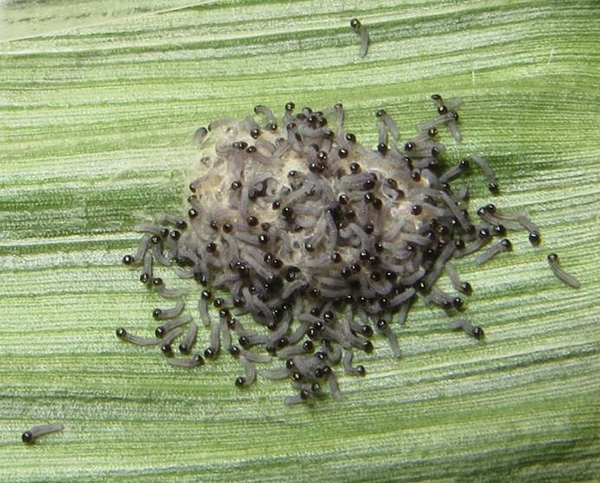 The fall armyworm—in fact, a caterpillar—can destroy as much as 70% of a farmer’s crop. It is especially hard on corn, or maize, as it’s frequently called in Africa. CRS’ agriculture experts across Africa are already reporting 20 to 30% crop losses. “This is very worrying, as this is only the first year of the fall armyworm invasion,” Ferris says. 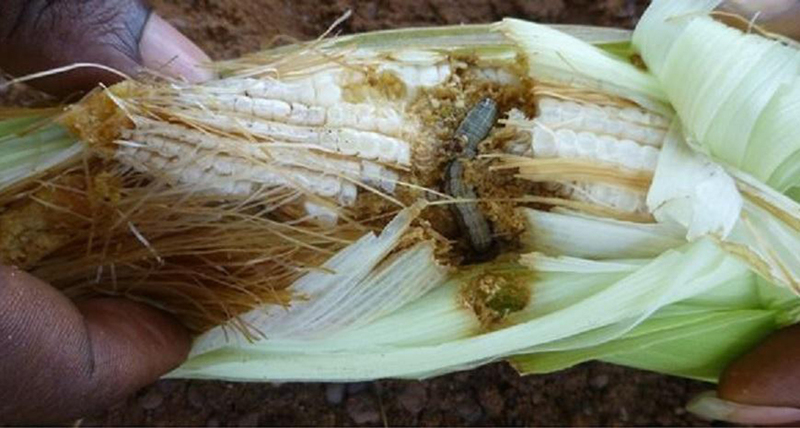 A report by the Center for Agriculture and Bioscience International in October estimated maize losses due to the fall armyworm will cost 12 African countries up to $6.1 billion per year. It is frighteningly aggressive. In its adult stage, as a moth, it can fly more than 60 miles in a single night. This speed has enabled it to cover virtually the entire continent in 2 years. The moths lay huge amounts of eggs, and the hatching caterpillars emerge with a voracious appetite. Then they break another rule at this point. Most caterpillars are fussy eaters, meaning they only feed on certain crops. But these hungry caterpillars feast on a broad range of vegetation. They prefer cereals, like maize and sorghum, but will eat almost any vegetation. Once fed, they reproduce quickly, living up to their name by gathering in large numbers to eat through their next crop. Many smallholder farmers who do not usually use pesticides have begun spraying to try to save their crops. Not only is this usually an ineffective use of scarce resources—caterpillars longer than a quarter-inch tend to survive spraying—but the incorrect use or overuse of chemicals can be dangerous. Farmers who rarely spray may not know how to do so safely. They often lack protective clothing, and over-spraying or spraying pesticides near harvested crops can mean poisonous residues enter the food chain. The next step to countering the caterpillar is scouting: searching and calculating how many fall armyworms are in a given area, and then alerting farmers. “Following scouting, we can recommend safe and effective treatments,” Ferris says. If the presence of fall armyworm is detected early, low-toxic chemical sprays can be very effective. “The key is to spot the problem early, and then apply the correct treatment at the right time,” says Ferris. “We are also looking at different ways to get the word out to farmers and to start a dialogue on potential treatment,” he says, noting that the pest has been effectively controlled in the United States.